In any long marriage there are ups and downs, times of passion and times when Dave probably thinks, "What the heck am I doing with this person?" I've done the same thing with food, from what's known in our family as my Velveeta Period in grade school through my decades-long affair with pesto (I blame the garlic). Several years ago the attraction waned and I moved on to other fascinations with poached eggs and stuffed pork, but recently a piece by Melissa Clark in the New York Times piqued my interest in looking up my old flame. The reason? It had undergone some cosmetic surgery and I was finding its new look curiously fetching. The basil had been replaced with pea shoots, and after a brief dalliance with those curly greens last spring, I've been flirting with them a lot more this spring. So when I saw some shoots waving their fronds at me from a table at the farmers' market, I brought them home and immediately looked up the recipe. A whirl in the processor, a little heat, and this new affair was off to a promising start. Put pine nuts, pea shoots, cilantro and garlic in processor. With processor running, drizzle in olive oil to make a paste. Pour pesto into mixing bowl and stir in parmesan. Bring pot of water to boil and add pasta. Cook till al dente. While pasta cooks, heat olive oil in saute pan and add garlic. 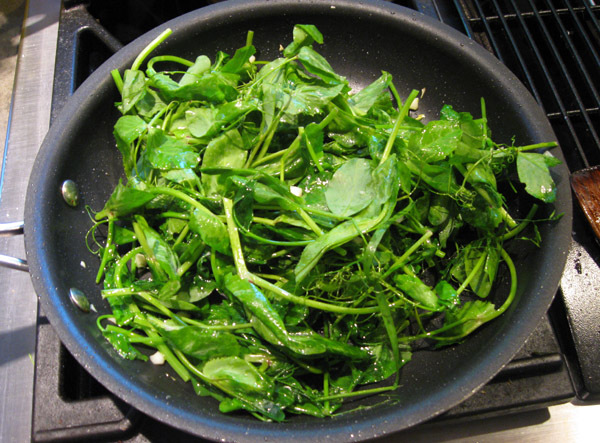 Saute briefly and add pea shoots, cooking till just wilted. Add tuna and stir to warm. Remove from heat and stir in lemon zest. Season to taste with salt and pepper. Drain pasta and put in serving bowl. Add pesto and stir to coat (you may not need all of it). Top with pea shoot mixture and sprinkle with parmesan.